Prostration is in fact a series of successive prostration accompanied by short prayers. The Church combines prostration with abstinence from food for a number of hours. Thus, on days when abstinence is not allowed, -e.g. feast days, Saturdays, Sundays, and the fifty days following Easter- then prostration are also not permissible. A belly full of food is not fit spiritually or bodily for prostration. Prostration are therefore better observed in the early morning or at any time during fasting before food is eaten. Prostration may be a form of self-abasement before God. 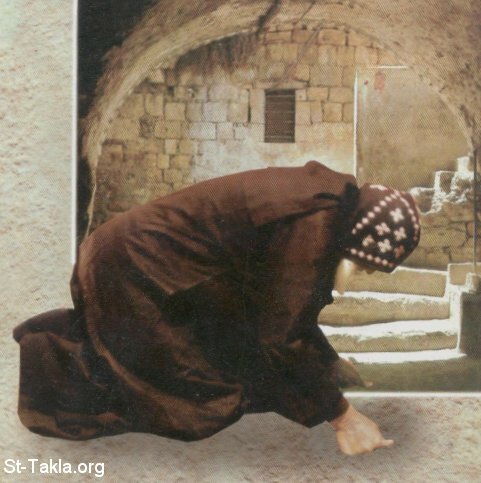 Every prostration, man rebukes himself before God for on of his sins and asks for forgiveness, saying: I have sinned, O Lord, in doing this or that, so please forgive me. I have desecrated Your temple, so please forgive me. Forgive me, for I am lazy, negligent.... etc. Prostration may be accompanied by prayers of gratitude and praise. Spiritual preliminaries, such as self-examination or any spiritual reading to soften the heart, may precede prostration.